Well, here I am on day two of my experiment in which I write whatever comes into my head and, inconveniently, my mind appears to be a total blank. I just finished reading Peggy Noonan’s column in today’s Wall Street Journal. Despite living an places where the Journal is widely read, I’ve never been a regular reader. However, Real Clear Politics sometimes puts up links to articles there. Her subject today is very evident from the title, “How Global Elites Forsake Their Countrymen.” Not a bad article, but it’s one in what is becoming a trend. That it took our scribbling elites as long as it has to state the obvious is notable failure of our supposed meritocracy. Still, now that our scribblers are on the case, let’s hope that our meritocrats in government and other positions heed their call. In the 1960s, he was a neo-Marxist and acerbic critic of Cold War liberalism. During the 1970s, he began to become a far more iconoclastic figure, fusing cultural conservatism with a Marxian critique of capitalism, and drawing on Freud-influenced critical theory to diagnose the ongoing deterioration that he perceived in American culture and politics. His writings during this period led him to be denounced by feminists and hailed by conservatives for his apparent defense of the traditional family. Lasch’s earliest argument.. was that American radicalism had at some point in the past become socially untenable. Members of “the Left” had abandoned their former commitments to economic justice and suspicion of power, to assume professionalized roles and to support commoditized lifestyles which hollowed out communities’ self-sustaining ethics. His first major book, The New Radicalism in America: The Intellectual as a Social Type… expressed those ideas in the form of a bracing critique of twentieth-century liberalism’s efforts to accrue power and restructure society, while failing to follow up on the promise of the New Deal. Most of his books, even the more strictly historical ones, include such sharp criticism of the priorities of alleged “radicals” who represented merely extreme formations of a rapacious capitalist ethos. The book of his that I have in mind is one that is not seen as one of his best and has been essentially forgotten. It is called The Revolt of the Elites and the Betrayal of Democracy. Written in 1995, I nearly threw it out during my last move. It had intrigued me at the time, but in my memory subsequent events had seemed to have proved Lasch’s thesis wrong. Before tossing it, however, I decided to take another look and wound up rereading the whole thing. Looking back, it seems that the brief prosperity of the mid to late nineties simply put the social tendencies he observed on hold. The title is an obvious nod to Ortega y Gasset. In The True and Only Heaven, I tried to recover a tradition of democratic thought – call it populist, for lack of a better term – that has fallen into disuse. For a number of years now, I’ve been arguing in private to friends that we need to develop a sort of liberal populism. Perhaps there was a subconscious influence from Lasch in that thought. Suddenly, however, we find ourselves in a political moment when the word “populism” is on the lips of our most elite scribblers, almost always as something to be feared and avoided at all costs. We are living in a very important time. The gap between the elites and the public is widening. The reason, as briefly shown, is the elitist language of little substance, detached from the people and their concerns. The people in response have revolted with votes of no confidence and support to new leaders who are antiestablishment. The only way to close the gap, to win back support, is to abandon the language of therapy and political correctness, to one of honesty and rational arguments. The word has come to serve simply as a description of the therapeutic state. When we speak of democracy today, we refer, more often than not, to the democratization of “self-esteem.” The current catchwords – diversity, compassion, empowerment, entitlement – express the wistful hope that deep divisions in American society can be bridged by goodwill and sanitized speech…. In our preoccupation with words, we have lost sight of the tough realities that cannot be softened simply by flattering people’s self-image. What does it profit the residents of the South Bronx to enforce speech codes at elite universities? A couple of weeks ago, my sister and I decided to make the best of the heat and we went to a state park that has a little bit of a beach. Afterwards, we went to a crab house. I sent this photo to Noel, but later I found myself wondering if he was aware that crabs are a really big deal in Maryland. I tried to see if I could find a link with some information and I learned a few things I didn’t know. Perhaps it will be of interest. For those of you who don’t know, Maryland is a mid-Atlantic state, meaning that it’s in the middle of the eastern seaboard of the United States. The Chesapeake Bay cuts deeply into the state. Crabs are highly associated with the state, specifically a variety called blue crabs, Callinectes sapidus. According to an article on Eater, Spike Gjerde, a Baltimore chef, the growing conditions in the estuary make the crabs from Maryland especially good. From a scientific perspective, the need for hibernation is the main reason Maryland crabs taste better than other types of crab — and also tastes better than blue crabs from other waters, according to Steve Vilnit of the Maryland Department of Natural Resources, Fisheries Services. He explains that just like other creatures that hibernate, crabs need to build up fat stores to sustain them through the dormant period. “This gives our crabs a buttery flavor that you won’t find anywhere else,” Vilnit says. Marylanders prepare hard shells and other seafood by steaming them, rather than the boiling that is common along the rest of the East Coast and Louisiana. Marylanders will tell you that boiling makes the crabmeat wet, rather than just moist. That people boiled them was news to me. Odds are at a crab house, what’s seasoning the crabs is made by J.O. Spice Company, not Old Bay. Established in 1945, the company supplies more than 800 restaurants in the mid-Atlantic, often creating custom blends that vary in saltiness and heat. They are served with apple cider vinegar on the side. Crabs are seasonal, and in Maryland they’re available from April to December. While June through August are the most favored and tradition-laden times for eating crabs, September and October are the best time to get the largest and fattest hard crabs at the best prices. 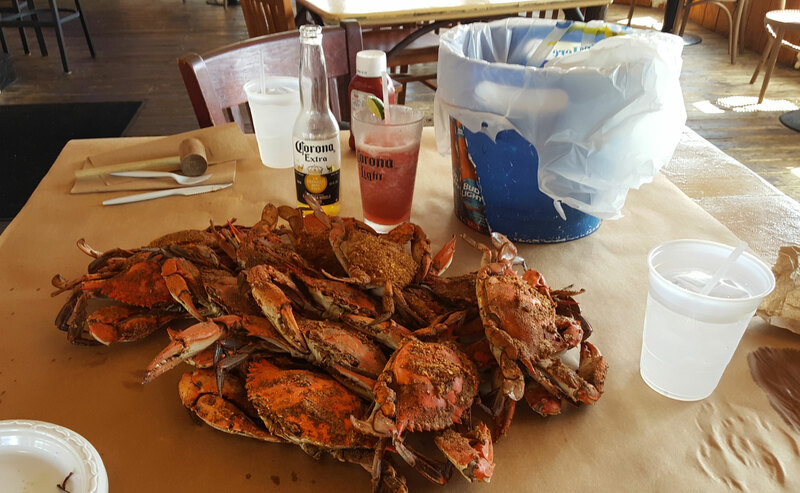 The Eater article lists several places to get crabs, but they’re not really a fancy item and there are a lot of places that are good. From earlier the same day.